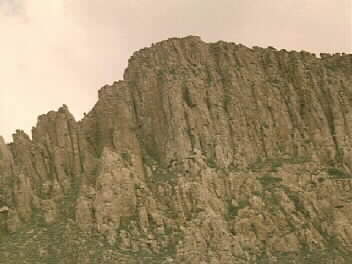 This is a photo of Apache Leap, located just outside Superior, Arizona. A legend states that a group of Apaches leaped off this cliff in order to escape capture from General Crook's troops. It is likely that the legend is based upon an historical incident, but no proof has been found. Furthermore, those who leaped off the cliff were, more than likely, actually Yavapais, who in the 19th century were called "Mojave Apaches."